This wasn’t exactly a spur of the moment decision on my part. I’ve been wanting to do it for a really, really long time, but I was never sure when or how or with whom it would happen. 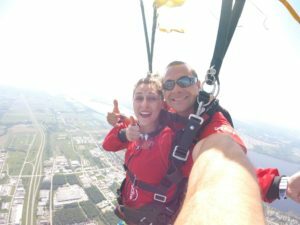 Oddly enough, Sarah, one of my newest friends, invited me to jump with her and a group of her friends. 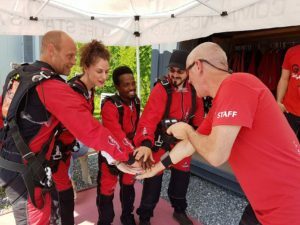 I was hesitant at first, partly because I didn’t know how I felt about jumping with a group of strangers, but also because I wasn’t quite ready to wrap my head around *ACTUALLY* going through with it. 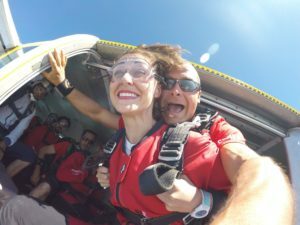 Sarah eased a lot of my worries when she called the skydiving place and got a rundown on their safety standards and all the precautions they take to ensure their flyers land without a scratch. I hemmed and hawed a little longer and finally agreed to take the plunge! Days later, my good pal Andrew texted me to say we should meet up and do something crazy this summer, like SKYDIVING or whitewater rafting. It’s like the guy read my mind! I told him my plans to jump on June 11th, and he was IN! Just like that. Andrew ended up making the five hour drive here with two of his good buddies, who I spent all day Saturday with. 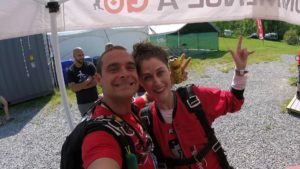 Then Sunday morning arrived…Jump Day. The boys came here to pick me up and together we drove to the airfield to meet our fate…er, fellow jumpers. Honestly, I couldn’t have hand-picked a better group of people to potentially die with. And man, is that ever a bonding experience! 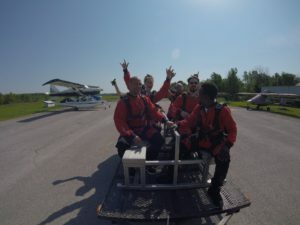 After we signed our lives away, we met our instructors. 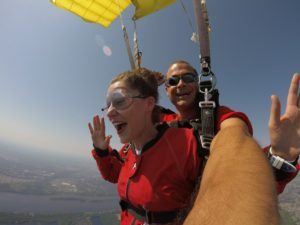 The adorable Patrick was assigned to me for my tandem jump, and I’m happy to report he piloted our parachute perfectly. Alliteration! As far as instructors go, I hit the jackpot with him. He has over 5,000 jumps under his belt, and he’s a hoot and a half to boot! Once we were suited up and given a few safety instructions, it was time to board the plane. 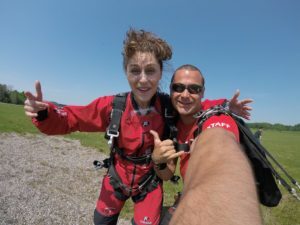 Hi, I’m Julie, and I’m a crazy girl who jumps out of airplanes! But Patrick had a good hold on me. Well, we were kinda clipped together and stuff. Siamese twinning it. Andrew and I played a round of rock, paper, scissors to determine who’d jump first, and I won! 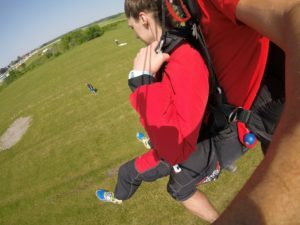 Which apparently meant I had to jump first…. Soooo, Patrick and I made our way to the giant open doorway in the plane. I expected to be sucked out like in the movies, which might have made it easier. 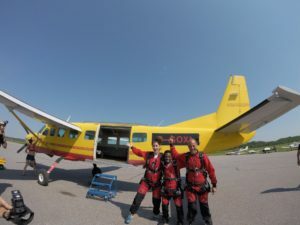 Instead, I had to willingly take a flying leap from the plane and plummet to the Earth. It’s go time! Am I laughing or crying? I don’t even remember leaving the plane, but somehow we were flying through the air. Sorry, dropping through the air at the speed of 200 kilometres an hour. But who’s counting? 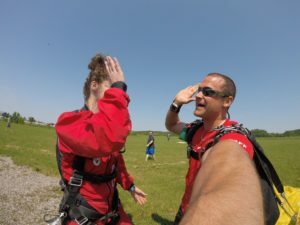 There is no way I can adequately describe the feeling of free-falling for a full minute. It’s terrifying, exhilarating, CRAZY AS HELL. I was telling one of my friends the other day that you can’t really soak it all in while you’re up there because you’re thinking too much. Thoughts like, ‘Will the chute open? Am I gonna die? How will my family take it? What’s the landing gonna be like? How high are we? When will the falling stop? 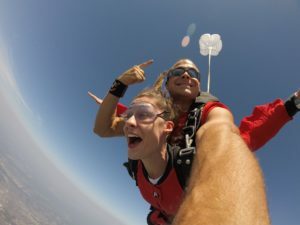 Why am I deaf?’ rattle around your brain for pretty much the entire duration of the free-fall. And then the ride comes to a jerking halt as the parachute opens (THANK YOU, JESUS!) and it’s almost, well, peaceful. If you’ve ever been parasailing you’ll understand the feeling. It’s so quiet and gentle and you just sort of coast over the scenery. I was so happy to be not moving at the speed of light. We did it! Also, when is the ride over so I can throw up? Motion sickness, you own me. Before I knew it, we were swooping down for a landing. 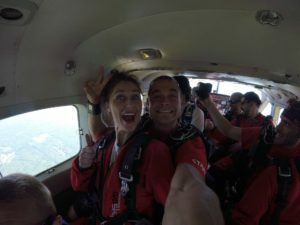 That was one of the parts I was stressing the most about, but Patrick, the expert that he is, flew us in a perfect path and we landed (very gracefully!) exactly where we were supposed to. Oh, solid ground, I missed you! And thus, the celebrations ensued! I smiled the whole time I was reading this! I think I’ve always been a bit of a chicken. lol, but I love the rides like the Demon’s Drop where you go straight down for several hundred feet. I dunno. 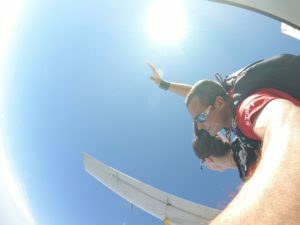 There’s a local skydiving business that scuba dives with the group my husband instructs for. He’s talking about trying it. White water rafting? Thrilling. One piece of advice, though…if you have the option to go single, go in a one man “duckie”. That is as long as you’ve kayaked or canoed enough that handling a paddle comes natural to you. It was a lot more fun than in a four man raft. And, yay for you! Getting out there and living! Way to go, my friend. I’m so pleased to see that beautiful smile. You mean this one? 😀 Hee, thank you, my friend! From the pictures you’d never guess there were any panicked thoughts tumbling through your head at all. You look like a professional skydiving model! Congrats on the successful landing! That should be one big ol’ check mark on the bucket list, for sure. Previous post Weekend Writing Warriors #39! Next post Weekend Writing Warriors #40!